It was only two weeks ago that 20th Century Fox dropped a trailer for Shane Black's The Predator, and already they are back with a longer, more violent cut for the red band crowd. Perhaps the rapid fire trailers is in response to news that Fox will be bringing the film to Comic-Con where it's sure to find a rabid audience of fans eager for the Predator's return. The film is a true sequel, following up on events of Predator, Predator 2 and between Predators, so the three best movies in the franchise by far. The Predators are lured back to Earth when a kid (Jacob Tremblay) makes a discovery of some alien tech. That puts them on a collision course with a team of rangers who are largely the focus of this new footage. Too bad for them these Predators are of the mega-deluxe variety. The rest of the cast includes Boyd Holbrook, Sterling K. Brown, Olivia Munn, Trevante Rhodes, Keegan-Michael Key, Alfie Allen, Thomas Jane, Yvonne Strahovski, Augusto Aguilera, and Jake Busey as the son of his father's character in Predator 2. Continuity! 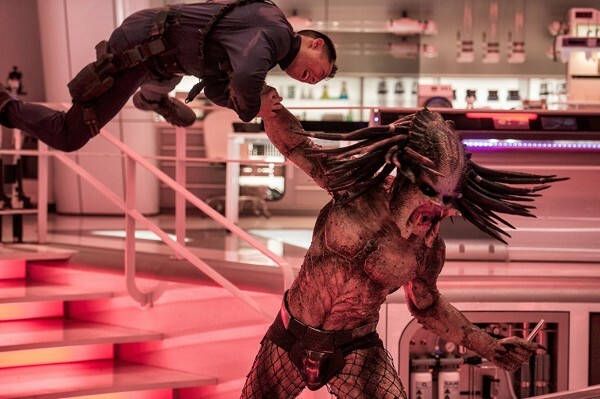 Here's the synopsis: From the outer reaches of space to the small-town streets of suburbia, the hunt comes home in Shane Black’s explosive reinvention of the Predator series. Now, the universe’s most lethal hunters are stronger, smarter and deadlier than ever before, having genetically upgraded themselves with DNA from other species. When a young boy accidentally triggers their return to Earth, only a ragtag crew of ex-soldiers and a disgruntled science teacher can prevent the end of the human race.